A mausoleum located at Calvary Episcopal Church Cemetery in Aston, PA. The neighborhood is known as "Rockdale." 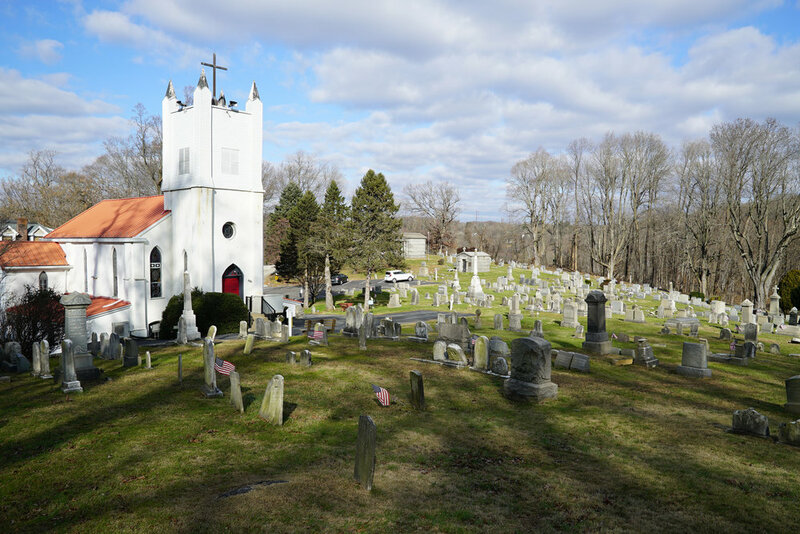 The church is now known as "Resurrection Episcopal Church, Rockdale"
and the website lists the address of 2131 Mount Road. Calvary Episcopal Church Cemetery, Aston, PA. Big hill. It's unusual to see a brand new marble headstone., It really stands out among the more traditional granite stones that are most typical now. This headstone is at Calvary Episcopal Church Cemetery in Aston, PA. More detailed information about who is buried here is on the other side. Located in the hilly "Lenni" section of Aston, Pennsylvania - the old mill town. Though this neighborhood is known as "Rockdale." This old cemetery does not have as many rules as others. Foundations are put in by the monument dealer. More pricing information to come. Calvary Episcopal Church Cemetery in the Rockdale section of Aston Township, Pennsylvania. November 29, 2018.